Hmmm… I’m thinking the good Doctor sees the trenchlines pretty clearly. He has them drawn in all nice and pretty for you, I hope everyone appreciates his sharing, I know I do! For my end of week update I decided to zoom out and give you a glimpse of how I see the overall battlefield for this entire bear market on the SPX 2 year day chart. The first thing I want to point out is that what most technicians see as the triangle or pennant from hell, I see as the coming intersection of the bottom of the yellow wave 4 channel and the all important dashed blue midline of the channel that has defined this bear market. It's a subtle difference looking at the pattern this way and doesn't really change the short-term trading impact of breaking either the top or the bottom line. What the trenchlines (channel lines) viewed from this angle does do is frame this triangle within the larger picture of the bear market. I channeled in the moves starting from the May 19 top last year showing the 4 channels that contain the 4 major moves in the market since that top. 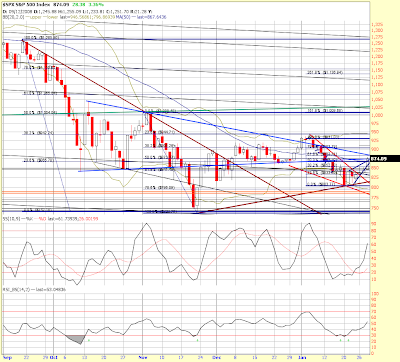 Wave 5 looks to be on deck along with another trip to the bottom of the channel. 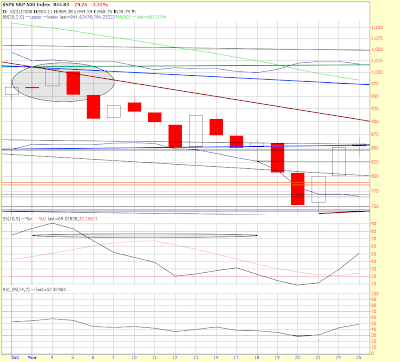 How does 615ish SPX around the end of March sound to you? It's a very real possibility and you better have some troops prepared to campaign with the bears or at least get your bull troops out of the way if the bears go on another rampage. As long as the bears continue to hold the lines this is where we are heading. 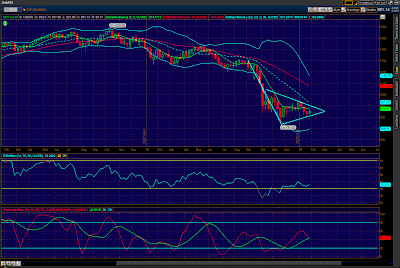 Obviously watching that triangle no matter how you view it is going to be key as we head into next week and next month. The trade of the month is going to be either catching the break of the triangle (which may be hard) or the easier trade and the one I am going to look for is to catch the retest after the line breaks. 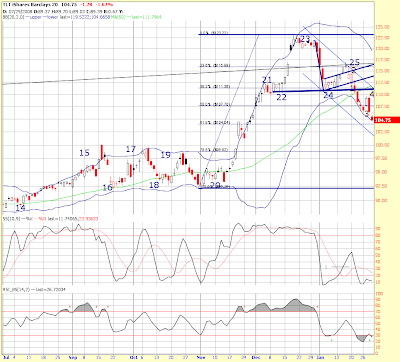 On a shorter time frame, I also dashed in what I think could be the budding wave 5 channel for this move. As long as the bears continue to hold this new trenchline (note it's fairly steep with the top line being around 855 and rapidly descending) I'm going to continue to keep the majority of bear troops I have positioned to front-run the wave 5 march downward. If we break that new dashed channel (and I think we might) then we are very likely to rattle around the mid 800s for another week or 2 while we wait for the major trenchlines/ the triangle to resolve themselves. Good luck next week and watch the key battle lines. Don't let your troops get caught with their pants down in case we get a sudden break. 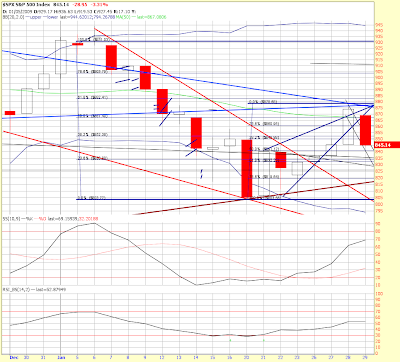 There are triangles in other key stocks and sectors that are much closer to resolving than the main SPX battle lines. How those individual battles resolve will determine the outcome of the larger war. The mechanics of a debt based money system favors the central banks. While Obama realizes that what's left of the middle class is disadvantaged and he struggles to "do something" to help them, he is at the same time surrounded by the very same people who helped create the unworkable math in the first place. 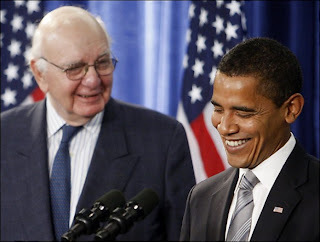 Make no mistake; while he may struggle to do the right thing, President Obama has wrapped himself with central bankers who have stated that they prefer to see a one world system that is owned and controlled by the central bank. Their vision is of a world where everyone and every country has already spent their future productivity and is thus indebted to them. 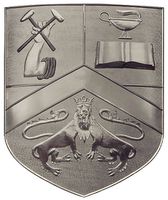 In this way, the future labors and production of mankind belong to them. Sound radical? That's exactly where they have us headed. I ask you to please assimilate the facts, understand the math, and realize that I sounded just as radical three years ago when I was talking about the credit bubble popping and economic storm that we face. Now here it is, and it's not over, not by a long shot. "In his weekly radio address, the president said he will soon unveil a plan that will help lower mortgage costs and revive lending." “…and revive lending?” See, that’s the problem in a nutshell. Everyone wants to revive lending. Basically they are saying, “Let’s recreate that credit bubble because it was so much fun!” How about stimulating some savings? That’s what’s going to happen regardless. This is more “pushing on a string” against consumers who already possess too much debt.
" Soon my Treasury secretary, Tim Geithner, will announce a new strategy for reviving our financial system that gets credit flowing to businesses and families,' Obama, a Democrat, said in his weekly radio address. 'We'll help lower mortgage costs and extend loans to small businesses so they can create jobs.'" Republicans, who opposed the president's stimulus package of over $800 billion largely because of its spending priorities, suggested mortgage help as well, proposing government-backed 4% fixed-rate mortgages for "any credit-worthy borrower,' Senate Republican Leader Mitch McConnell said. 'The availability of these low-interest loans would increase demand for houses significantly and low-interest mortgages would boost household income,' McConnell said in a separate radio address. " Huh? See, here are people who don’t understand the difference between credit and income. People don't need more credit, they have too much already! What they need is real income from producing something other than a paper shuffle. I think what McConnell meant to say is that by fixing low interest rates consumers can take on even more debt, or they could choose to save or spend the difference in a refinancing, but guess what? That won’t happen. And, there is no free lunch. Forcing interest rates down, no matter how they do it will also devalue the currency, once again proving that there is no free lunch in economics. The very notion of a money system that requires never ending growth is just insane, it is an attempt to defy math over time and cannot work for sustained time periods. People throughout the world have borrowed their future productivity away – they have pulled their income forward. Now it’s time to pay up – even better, it’s time to get to work creating a sustainable long term dollar system that is not based upon debt, but is instead based upon productivity (no, that would not eliminate private party interest). Step one in the transition? Eliminate the fed, let the free market set interest rates, create a legitimate market place and regulatory framework for legitimate credit derivatives, eliminate all speculative derivatives, and force the “bad banks” to mark to market immediately. Yes, most of the “bad banks” would be instantly insolvent and would die. Too bad, but there are plenty of good banks and budding entrepreneurs who are ready and willing to fulfill legitimate banking roles. Oh, and lockup the bad actors like Hank Paulson, Jamie Dimon, John Thain, Angelo Mazilo, Bernie Madoff, and many others! You get the idea. They all belong behind bars, especially Hank Paulson who, in my opinion, has done far more damage to investors and the United States of America than Bernie Madoff could even imagine. No, he was not acting on behalf of America and Americans; he was acting on behalf of himself, Goldman Sachs, and all the other criminals who knew exactly what they were to doing to rob the citizens of this country. Unfortunately, President Obama has surrounded himself with more Keynesian nut jobs. I say that not as a joke, but in all seriousness. It is quite literally insane to continue to attempt to elevate deficit spending deep into the multi-trillion dollar level in an attempt to re-inflate the world on behalf of the central bankers. It is quite literally insane to continue spending more on our “defense” than the rest of the entire planet combined. Now, if you think all of that is radical, then all I can say is, by all means, just do nothing until the markets have lobbed off 90% of their value! When we have all awaken from our mass delusions and group insanity, then we can get about the business of creating a sustainable system going forward. While I applaud some of the moves taken by President Obama, he must wake up to the math and surround himself with people who understand the situation, it’s root causes, and who the bad actors are. Here’s a hint Mr. President – whatever the current crop of central bankers suggest, do the opposite! It’s time. Doing the right thing will be painful, but continuing to do the wrong thing will be even more catastrophic. It’s time to turn the page, Mr. Obama… They're hurting down on Mainstreet. Jan. 31 (Bloomberg) -- Banks in Florida, Maryland and Utah were closed yesterday as regulators wrapped up the busiest month for failures since the housing slump began in 2006. Ocala National Bank in Florida and Suburban Federal Savings Bank of Crofton, Maryland, were shut by federal regulators, according to statements sent by the Federal Deposit Insurance Corp. MagnetBank of Salt Lake City was seized by the Utah Department of Financial Institutions. The banks had total assets of $876.4 million and deposits of $790 million. Six banks have failed this month as tumbling home prices and a 16-year high in unemployment boost foreclosures. The FDIC classified 171 banks as “problem” in the third quarter, a 46 percent jump from the previous period amid the worst housing crisis since the Great Depression. Regulators closed 25 U.S. banks last year, the most since 1993, draining money from the FDIC deposit insurance fund, which had $34.6 billion as of Sept. 30. Ocala and Suburban Federal combined will cost the FDIC fund about $225.6 million, the regulator said. No estimate was provided for MagnetBank. Suburban Federal’s seven offices were scheduled to open today as branches of The Bank of Essex of Tappahannock, Virginia, which acquired the deposits. The Office of Thrift Supervision said it seized the bank because of more than a year of losses stemming from soured residential, construction and land loans. “The OTS determined that Suburban was critically undercapitalized and in unsound condition,” the regulator said in an e-mailed statement. Ocala was closed by the Officer of the Comptroller of Currency. CenterState Bank of Florida in Winter Haven is assuming the deposits and four branches. “Deposits will continue to be insured by the FDIC, so there is no need for customers to change their banking relationship to retain their deposit insurance coverage,” the FDIC said in the Ocala statement. The FDIC said it was unable to find a buyer for MagnetBank’s deposits, the first time that’s happened since 2004. Insured customers will be mailed checks for their funds next week. The FDIC, the Treasury Department and Federal Reserve have stepped up efforts to aid U.S. institutions that reported more than $500 billion in writedowns and credit losses, and raised more than $400 billion in capital last year. The U.S. on Jan. 16 gave Bank of America Corp., the largest bank by assets, $20 billion cash and $118 billion in asset guarantees to help absorb losses after the acquisition of Merrill Lynch & Co. Citigroup Inc. got $20 billion and $301 billion in guarantees in November. As I expected, we closed right around the S&P 820 area. That’s right at the brink of the Armageddon 599 point pennant line, it’s coincidental with the 78.6% Fibonacci line, and it’s coincident with 8,000 on the DOW which is the EXACT number we closed on. This, indeed, should confound the greatest number of casino patrons/ investors. 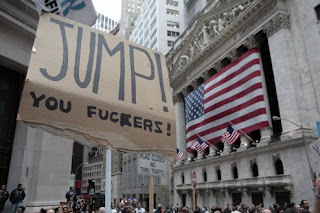 Stopping and sitting on the precipice is also a place where the institutions like to start rip roaring rallies from just to steal from the people who haven’t figured out the “house rules.” Heavy XLF and financial call buying going into the weekend close didn’t come from mom and pop either. 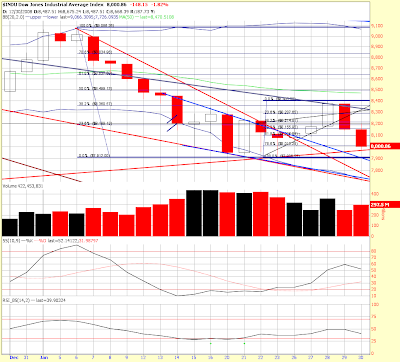 That bearish candlestick pair I showed yesterday proved to be prescient, once again followed by a big red day. If it’s right, we should get some sort of pause or ramp job early next week and then we find out where the market is really heading. For today, the DOW lost 148 points, the S&P gave back 2.3%, the NDX lost 2%, and the RUT finished down 2.1%. 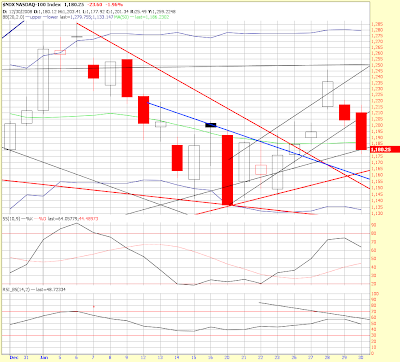 The XLF lost 2.8%, IYR lost 3.2%, bonds had another negative day and gold was up. 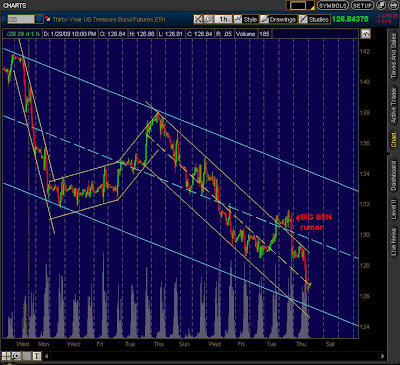 Internals were pretty negative with downside volume at 86%, decliners over advancers by 3 to 1. 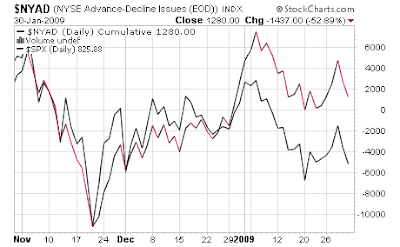 Then, they flipped and the A/D line is now above the price… that’s the positive divergence, but it’s not real large. Here’s a 3 month view so you can see that they are following one another, but the gap has gotten a little wider. 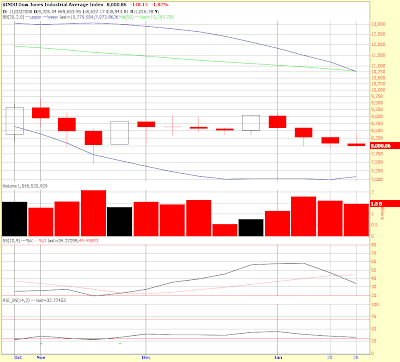 Something to be careful of as it indicates that the market is being held down by a smaller group of stocks. 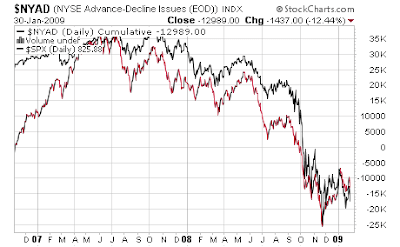 Don’t get me wrong – this divergence can grow to be huge ( it was GIANT in 2006 – bearish then, much larger than this, and it lasted for longer than a year). Since today is the last trading day of January, how are we looking so far? Remember the adage? I show the S&P down 8.6% for the month of January! So goes the rest of the year? No, you don’t want to annualize that number, not unless you’re in your bunker. Overall it’s a dangerous place to be sitting over the weekend. How ‘bout that GDP number? Pretty much a space oddity! Well, the big report this morning was the 3.8% GDP report. What can I say? I was expecting the number to not represent reality and, sadly, I was not disappointed. Yes I am a complete cynic and very skeptical of all government reports that have any type of seasonal or inflation adjustments. The game, when played over long time periods, compiles distortions on top of distortions until nothing makes sense anymore. People in America are confused. Why does it seem like the economy and markets are crashing down yet the statistics that come out of the government aren’t all that bad? Well, it’s because they are not real – they are lies that were slowly introduced over time. The people putting out the reports may not even realize the distortions themselves, but the people who introduced “hedonistic adjustments” and decided to begin excluding energy and food in the inflation data (which affects all the other calculations) most certainly did realize what they were doing. This needs to be UNDONE, and it needs to start NOW in order to bring back believability and to restore faith in our government. I call on President Obama to create 100% transparency in government statistics and to make a complete overhaul of the way government economic statistics are reported. I think he should immediately appoint John Williams (of Shadowstats.com) to oversee this revamp! But hey, let’s not stop there! Let’s reform our false accounting standards too, shall we? Heck, even our own former Chief of the GAO, the head accountant for the government – David Walker, refused to sign any of our own government budget reports. That’s how little faith he had in his own government’s office. Leadership by example, remember? We dictate that companies use GAAP accounting yet refuse to acknowledge our own accounts payable and use CASH accounting. We rob Peter to pay Paul by shuffling money from one account to another. We hide literally hundreds of billions worth of military spending in other budgets while we spend more money in total on our military than the rest of the world combined. And we allow the pigmen who run our financial institutions to use mark-to-fantasy accounting that would make the boys at Enron blush out of humility. Then we give them taxpayer bailouts! It’s frustrating and just maddening as hell to see the greatest nation in the world turned into a banana republic by a bunch of liars and thieves. Sorry for the extremely negative rant, but it needs to be said. The sooner we remove these cancers the more meat that will be left on the dying patient. As far as the morning update? Well, let’s just say that people are beginning to figure it out – painfully so. The markets tried to ramp and were rejected. I was late getting this out because I had to buy some more puts! The short term oscillators are oversold, the 60 minute slow still has room, but the 30 is deep, deep oversold and can, of course, stay that way for awhile, but be careful. 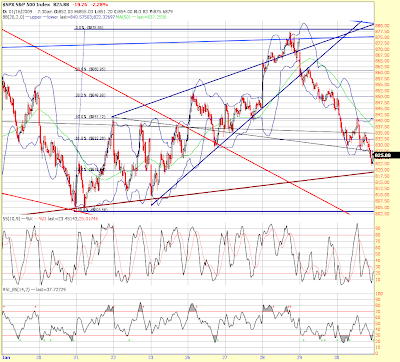 Here’s my 10 minute chart of the SPX. See that burnt red line at the bottom? That’s the line that represents the bottom of the pennant. Break that and, well, I hope everyone’s ready. 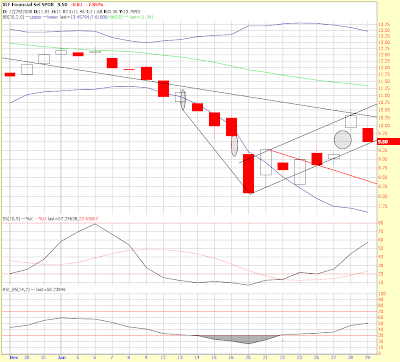 It’s not that far away and that pennant is worth 599 points. 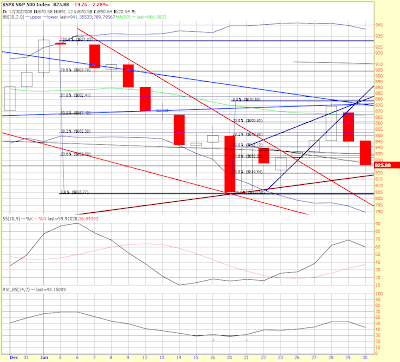 The next support level here is the 61.8 at 832. It looks like they used a .6% deflator (excluding food & energy), but can almost guarantee you that REAL GDP growth was much worse than reported (I'll get the solid numbers later). Just look at transportation, the financial industry, manufacturing, the service industries... no, the fun with numbers games obviously have not ended. All the "little white lies" add up over time and are, in fact, one of the reasons we wound up in a bubble economy. Believe what you will. Jan. 30 (Bloomberg) -- The U.S. economy shrank less than forecast in the fourth quarter as a collapse in spending led to a buildup in inventories that will cause companies to retrench even more in the early part of this year. Gross domestic product contracted at a 3.8 percent annual pace from October through December, the most since 1982, the Commerce Department said today in Washington. A gain in stockpiles contributed 1.3 percentage points to growth, partially compensating for a back-to-back drop in consumer spending. 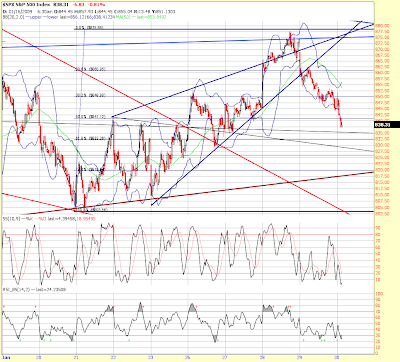 Prices also retreated. The economy is likely to contract further in the first three months of this year as retailers and manufacturers, from Starbucks Corp. to Boeing Co., this week announced plans to slash payrolls and cut production to get rid of unwanted stocks. Today's report will maintain the pressure on President Barack Obama to win quick congressional approval of a fiscal stimulus package. GDP was forecast to contract at a 5.5 percent annual pace last quarter, according to the median estimate of 79 economists surveyed by Bloomberg News. Projections ranged from declines of 3 percent to 7 percent. The world's largest economy shrank at a 0.5 percent annual rate from July through September. The back-to-back contraction is the first since 1991. For all of 2008, the economy expanded 1.3 percent as a boost from exports and government tax rebates in the first half of the year helped offset the deepening spending slump. Congress is considering a two-year fiscal stimulus package supported by Obama. House lawmakers this week passed the $819 billion measure. The GDP price gauge dropped at a 0.1 percent annual pace in the fourth quarter, the most since 1954, reflecting the slump in commodity prices. The Federal Reserve's preferred measure, linked to consumer spending and excluding food and fuel, rose at a 0.6 percent pace, the least since 1962. Unadjusted for inflation, GDP shrank at a 4.1 percent pace, the most since the first three months of 1958. The drop in so- called nominal growth explains why corporate profits slumped as the year ended. ``This is a severe, steep, broadly-based recession'' with ``no quick fix,'' Stephen Roach, chairman of Morgan Stanley Asia Ltd., said in a Bloomberg Television interview from Davos, Switzerland today. Consumer spending, which accounts for more than two-thirds of the U.S. economy, dropped at a 3.5 percent annual rate last quarter following a 3.8 percent drop the previous three months. It's the first time purchases declined by more than 3 percent in consecutive quarters since records began in 1947. Americans may pull back further as employers slash payrolls. Companies cut 524,000 workers in December, bringing total job cuts for last year to almost 2.6 million. ``We are clearly operating in an unprecedented economic environment that requires us to make some extremely difficult decisions,'' Chief Executive Officer Gregg Steinhafel said in a Jan. 27 statement. The economic slump intensified last quarter as companies also retrenched. Business investment dropped at a 19 percent pace, the most since 1975. Purchases of equipment and software dropped at a 28 percent pace, the most in a half century. The slump in home construction also accelerated, contracting at a 24 percent pace last quarter after a 16 percent drop in the previous three months. Inventories grew at a $6.2 billion pace in the fourth quarter, the first gain in more than a year. It's contribution to growth was the biggest since the fourth quarter of 2005. The GDP report is the first for the quarter and will be revised in February and March as more information becomes available. Stocks. Bears took control from the bulls today, but unless you were up at 2 AM EST for the break of the bull channel or 5 AM for the retest you missed the sweet entry and trade of the week. 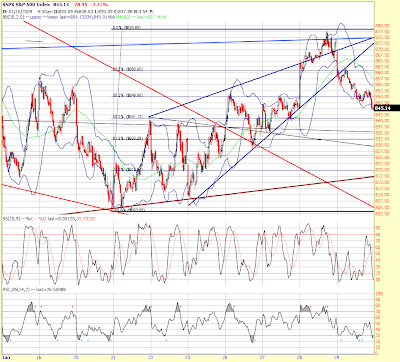 I've adjusted the primary wave 2 yellow channel to more of a flat. 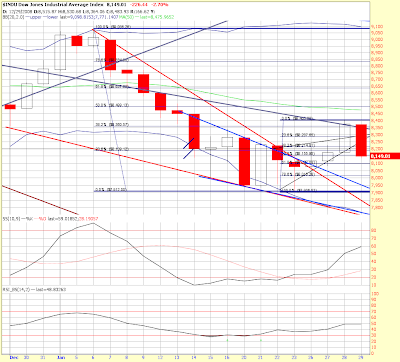 Short term the bears remain in control as long as the top line of the new bear channel holds. Longer term, we need to break the bottom line of the yellow channel which is slowly rising from 800 for confirmation the bears are serious about this next campaign south. I'm also including an SPX chart which has both the triangle many technicians are now pointing to as well as a possible channel for a wave 5 move. Bonds. 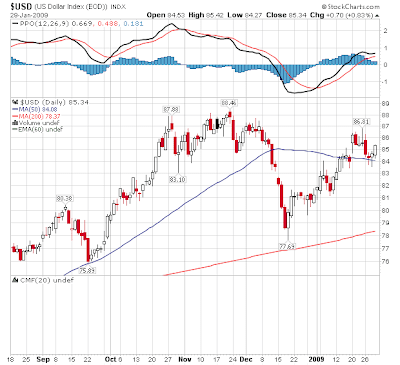 Bonds got destroyed today and continued their march towards calling the Big Ben bluff. 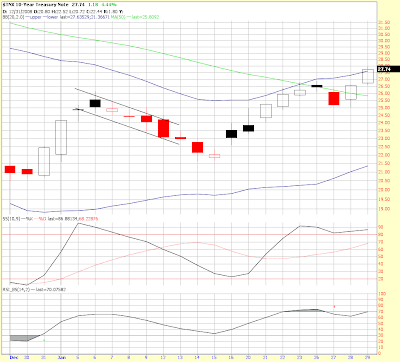 Short term the count looks fairly obvious with 3 of 5 for the current impulse ending today or about to end. 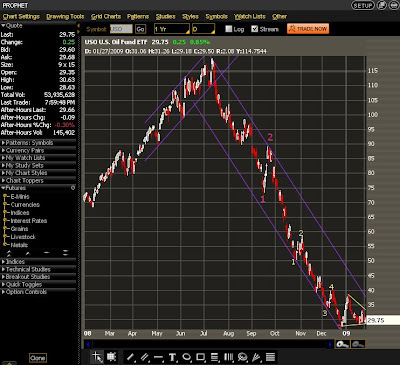 Longer term the blue channel is in control and I expect the bond bears to continue to take territory until Bernanke is forced to bring Big Ben to the battle field and not just threaten the bears. We also had a classic overthrow out of the channel followed by a quick and violent reversal back into the channel where it has once again begun rattling it's way on down. 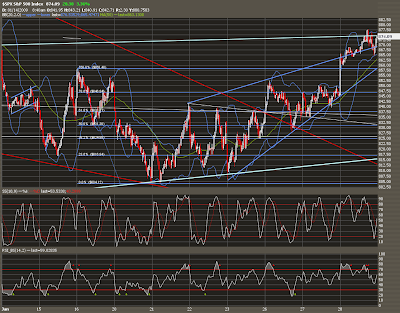 I agree with Mark that we’re most likely in wave 5 down on TLT. There’s an open gap in the chart around the 100 mark and I’m pushing my luck hoping for a gap fill, but will withdraw my troops on any strength here. I note that /ZB landed pretty much right on the 50% retrace of the parabolic move up, and TLT landed right on the 61.8% tonight. 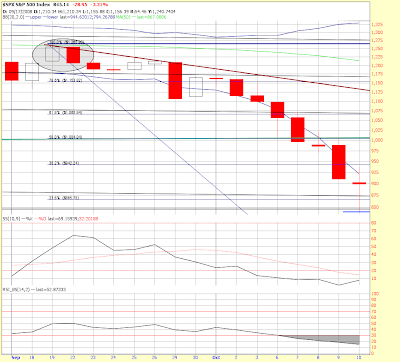 A 78.6% retrace takes us to the bottom of that gap. Will that happen here in wave 5? Don’t know, but with a parabolic collapse, it’s likely. Remember, parabolic collapses do not stop at 50% marks (these fibs are just of the last parabola, not the entire bull run). They go on and on. I sincerely hope this one does not. Unlike most municipalities, New York is doing the right thing. Doing the right thing after so many years of doing the wrong thing is going to be painful, no doubt. Other cities and states need to be paying attention, as should all investors. Slashing expenses and raising taxes is painful, no doubt. Yes, raising taxes is a further drag on the economy. We all should have thought about that long and hard - much, much sooner. But it reverses the bad math, a simple concept many are going to re-learn in the near future – Are you listening California? Washington, D.C.? Mayor Michael Bloomberg was to deliver some devastating financial news to New York City residents on Jan. 30. After sharpening his red pencils and spending long nights squeezing the treasury for every penny, Mayor Michael Bloomberg is set to tell New Yorkers on Friday that the budget for the next year will be excruciatingly painful. Jobs will be axed, programs slashed and lots of things will cost more. Wall Street and the spiraling out of control economy have dealt New York City a bad hand. The mayor has no trumps to play as he lays out a spending plan whose gap has grown nearly 400 percent in three months. Shrinking tax revenues have turned the $1.3 billion November budget hole into a now-$4 billion chasm. Schools Chancellor Joel Klein has already said he could be forced to eliminate 15,000 education jobs, one third by attrition. The federal stimulus package could save some of the teaching jobs. "New York will get about $1.8 billion in education funding and that may not eliminate the need for cuts but it should make it much less severe," Sen. Charles Schumer said. Deputy Mayor Edward Skyler said: "The mayor is cutting agency spending as much as he can without compromising our quality of life. But in order to close the deficit without destroying the core services New Yorkers rely on, the mayor will need help from all our partners, from the municipal unions to the leadership in both the state and nation's capital. We all have to do our part to get through these tough times." The mayor will lay out the rest of the bad news -- yet more service cuts and fee hikes – on Friday. Jan. 29 (Bloomberg) -- The difference between 10-year Treasury Inflation Protected Securities and nominal Treasuries rose to one percent for the first time in more than three months as traders brace for government-induced inflation. Inflation concern is increasing as policy makers look to boost government spending and expand Federal Reserve lending to counter the worst economic slowdown in 25 years. President Barack Obama’s $819 billion stimulus package, which does not include an estimated $1 trillion bank-rescue plan, may soon be passed by Congress. Thirty-year bond yields have risen 82 basis points this month to 3.5 percent as investors shy away from government securities most sensitive to inflation. The difference between 10-year TIPS and Treasury notes, the so-called breakeven rate, increased 11 basis points, or 0.11 percentage point, to 1 percent at 1:26 p.m. in New York. The yield gap, a reflection of traders’ expectations for inflation over the life of the security, was as low as minus 0.08 percent Nov. 20. It was last at 1 percent on Nov. 10. They may have “tools,” but they are standing naked in a TSUNAMI while trying to use them. 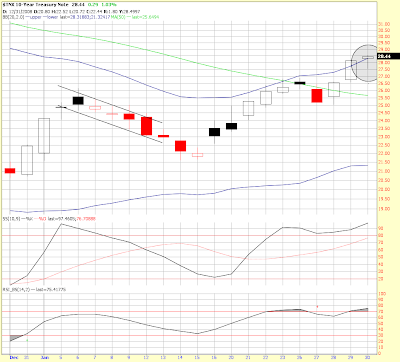 Here’s the TNX (10 year)… launching above the 50 day average and running into the upper Bollinger band. Up nearly 5% today! 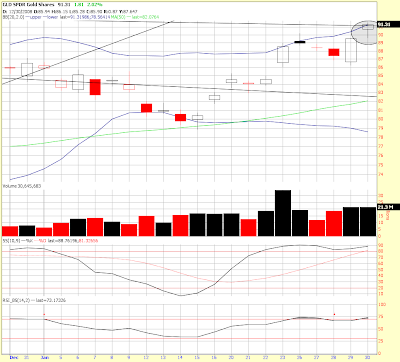 And look at the IRX (3 month)… up above the upper Bollinger and rising. 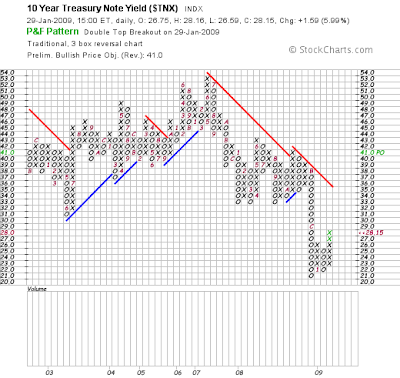 While rates are still low, this is a powerful thrust, one that has to have the Fed very nervous. As the entire curve shifts higher, interest rates go up, exactly what is not needed and exactly what happened during the Great Depression. 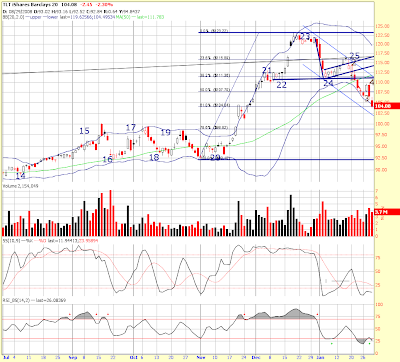 Ignore the charts if you want, I think TLT is fulfilling that 3 peaks and a domed house pattern. The real ugly? 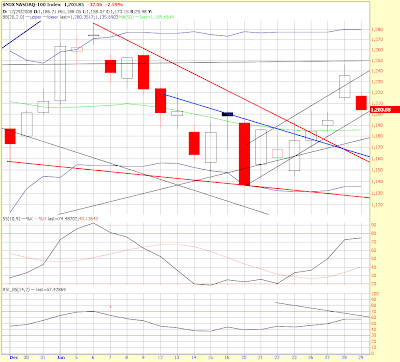 I’ll give Denninger credit for pointing out this pattern again this morning… that’s a pennant on the weekly SPX chart. The top of that staff is at 1,313, the bottom at 714… that’s 599 points. If it breaks downwards, the expected direction for such a formation, you would be looking at a target of… get this… less than 300! Ah, Well... we can always HOPE that it breaks the wrong way, but bonds and stocks selling off in concert is a clue that all is not well. Hello, is there anybody out there? New Home Sales Record Low, Jobless Claims Record High… My, Oh My! Note that unlike existing home sales data, inventories of new homes continued higher. That says a lot to me about the influence of banks and their handling of foreclosures affecting the existing home data. Jan. 29 (Bloomberg) -- Sales of new homes in the U.S. fell in December to the lowest level on record after banks tightened lending and job losses mounted. Purchases dropped a more-than-forecast 15 percent to an annual pace of 331,000, the lowest level since at least 1963, according to a report from the Commerce Department today in Washington. Other reports showed orders for durable goods slumped for a fifth month and a record number of Americans were collecting jobless benefits. The drop in home purchases indicates the housing slump at the center of the global credit crisis and economic downturn will persist well into 2009. President Barack Obama has pledged to stem foreclosures and boost job creation to break the longest recession in a quarter century. Economists forecast new home sales would drop to a 397,000 pace, according to the median forecast in a Bloomberg survey of 70 economists. Estimates ranged from 345,000 to 412,000. Commerce revised the November sales pace down to 388,000 from the 407,000 rate previously reported. Orders for durable goods fell 2.6 percent in December, more than anticipated, other figures from Commerce showed. The declines signals a slump in business spending will deepen and prolong the recession. A Labor Department report showed a record 4.8 million fired workers received unemployment benefits in the week ended Jan. 17. First-time filings last week increased 3,000 to 588,000. 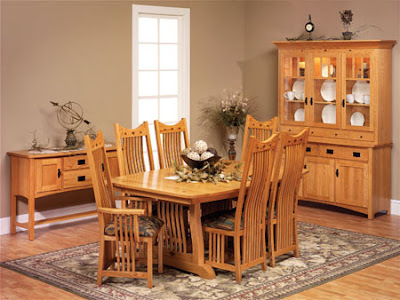 For the full year, sales fell a record 38 percent to 482,000, the fewest since 1982, Commerce said. The median price fell 7 percent, the most since 1970, to $230,600. The housing report showed builders were unable to trim inventories as fast as sales dropped. The number of homes for sale fell 10 percent to a seasonally adjusted 357,000, the fewest since Sept. 2003. Sales of new houses dropped in all four regions, led by a 28 percent decrease in the Northeast and a 20 percent slump in the West. In a report free of special factors and pointing clearly to severe contraction in the labor market, initial jobless claims rose 3,000 in the Jan. 24 week to 588,000. The prior week was revised slightly lower to 585,000. The four-week average jumped 24,500 to 542,500. Continuing claims show special weakness and indicate that the unemployed are not finding work. Continuing claims for the Jan. 17 week, the most recent data available, jumped 159,000 to a record 4.776 million. A comparison with mid-December shows a 404,000 gain for continuing claims. Stocks were just plain overbought and the oscillators finally exerted enough weight to make it descend back down to earth… OR you can blame the Jobless Claims that rose to 588,000 which is higher than expected, again… or you could site the fact that Ford lost ANOTHER $5.9 billion in the 4th quarter which adds up to ONLY $14.6 billion for the year – but hey, they don’t need taxpayer help, I’m so proud – but not believing they will survive any more than GM or Chrysler… or you could blame the 3,000 people who Kodak just slashed… or the 28% decline in profits at Shell… or the fact that Sony reported a loss… or you could blame the pork laden new “bailout”/make the math worse stimulus plan that just passed the House… or you could blame the weather. Take your pick, really, that’s how the people on TEEVEE do it. Clearly, that’s why the DOW is off nearly 100 points and the S&P is down 10. Of course the daily tsunami of piss poor underlying fundamentals usually don’t bother the stock “professionals” that are paraded on CNBS – neither does the math of debt. Or, is it a Fibonacci and oscillator thing? You get to decide, but all I can say is that the stochastic was way over bought on all time frames up to 60 minutes and here we are. I was looking over my now crowded charts (since we’ve spent so much time in this range), and noted that I’m now working with four sets of Fibonacci retracements levels that’s turned my working man charts into something that looks akin to a K.D. gone wild Fibonacci party. 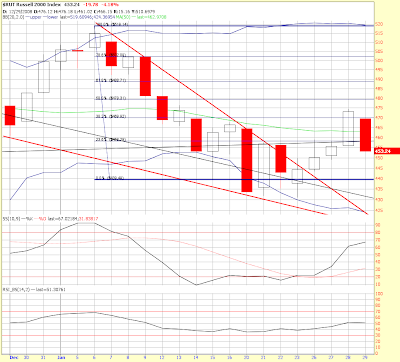 Let’s start on the 10 minute timeframe so that we can pick out some targets in case we break that wedge bottom. First note that we are going to open around 858 on the /ES which is about 862 on the SPX which puts us just above the wedge bottom and the 23.6% line. If we break that wedge, the 38.2% is at 850… the 50% is at 841, and the 61.8 is at 832, any of which could stop the decline and will stop it if McHugh is correct in that we are in wave ‘c’ of wave B. 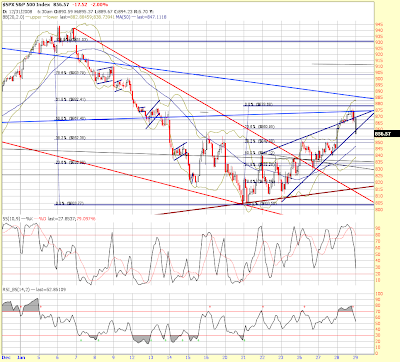 If so, then this retrace may be the beginning of the second wave of potentially five. Of course, we could be working on the end of wave 4 instead – I do not know which! And, I do not favor one count over the other, but I will say this – when I bet against McHugh’s count, I usually lose money! Now, let’s zoom out some more and we’ll find our fourth set of fibs that begin on the top of what we now consider the start of wave 3 of A. Note that the 23.6% line here is coincident with the 50% line from the November highs that stopped yesterday’s move cold. Hmmm… the plot thickens. That is a VERY imported spot… if we are in wave 4, that could very well be it. It’s not going to be it if we are still in wave B. That makes what happens from here important in my mind. McHugh has a triangle that could take us a little bit above 900 and then back down – that could very well be happening, I don’t know yet. 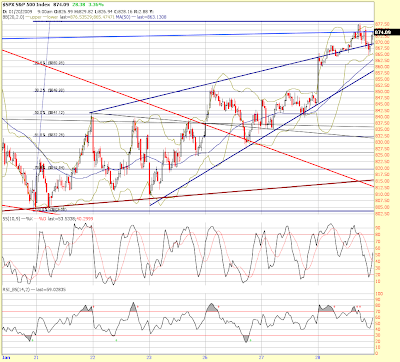 In the short term, I will play short a break of that wedge below about 859 on the SPX and see were that takes us. Then again, we might stay in that wedge and just keep on trucking… “Flexibility is the key to air power,” or so they told me in the Air Force! Stocks. 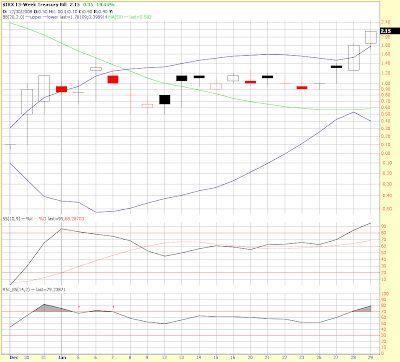 The bulls continue to hold the line and prices surged on better volume, but not great. 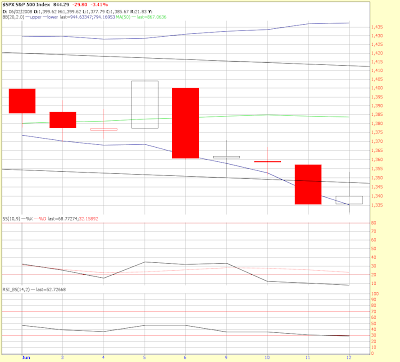 Take out the FOMC whipsaw and volume was pathetic for most of the advance. 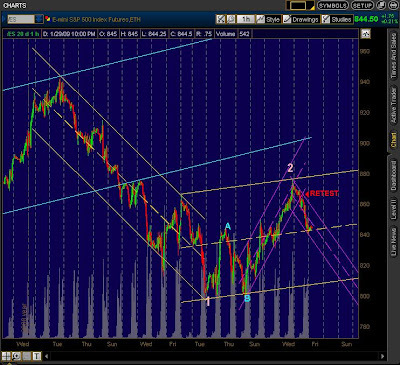 I'm sticking to my thesis that the best trade this week will be when we spill out of the pink channel on volume. Until that happens you are front running any shorts you put on. I've been doing a little of that front running, but I am saving the big guns for when we eventually break and likely retest the pink channel. 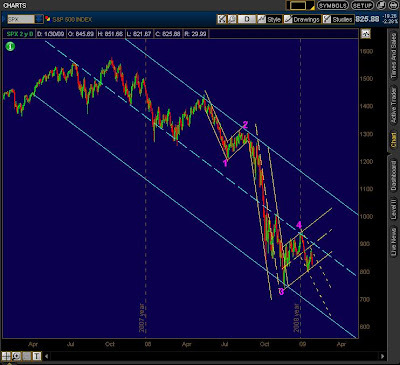 Also keep a close eye on the blue channel if we get more powerful rally over the next couple of days. 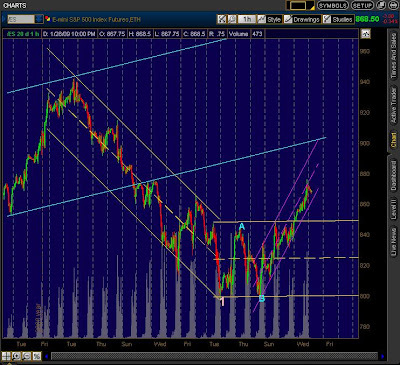 That bottom line of the blue channel is THE uptrend line we held so many times on the move off the November lows. 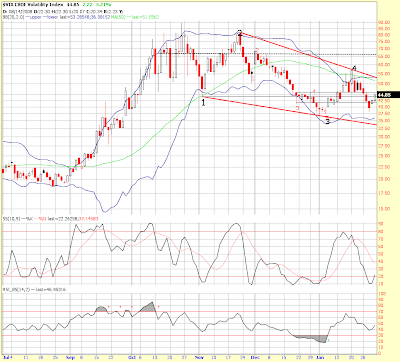 It should be powerful resistance and I plan to swing big there on the short side if we tap it from below. If we break back north of it and start trading in it again, get long again and stick your stop just under the nice rising trendline, because the bulls are going to go on a rampage. Bonds. The rumor of BIG BEN being brought to the battlefield immediately turned out to be false and the bears took that initiative and slammed us right back into the down channel. 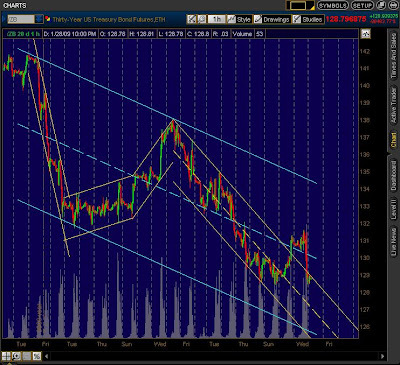 Notice how the channel offered resistance again earlier this evening after it fell back in. A very positive development for the bears and I think they are going to get their wave 5 for this impulse which started today. 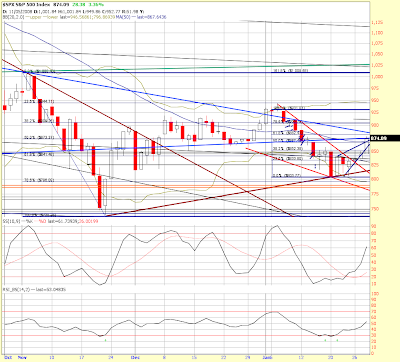 The 50% retrace of the entire parabola up would be 127 ZB and I would look for a bounce or at least a pause there. 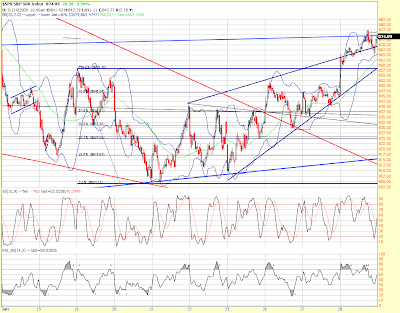 I'm out and will look for a re-entry once this impulse is over and we get some sort of retrace (channel) going. The bulls and bears in oil are set to have a big rumble early next week. If you get the yellow line and purple line coming together you are setting up for an explosive move when this wave 4 triangle breaks. You can tell by my count I think it breaks down. Mark does a great job of ushering his troops, but he currently doesn’t have any in this bond battle and is looking to rejoin the fight. I took a different approach on this trade because I knew that having only highly leveraged, closely dated TLT puts would mean that I would likely have to exit and re-enter this trade repeatedly. Thus I took a three tiered approach as I saw that this might be a trade that lasted a while and getting the timing right is always difficult unless it just outright crashes. So, I bought a 3 way combination of puts when I first entered this trade. Since I had a good entry point and corresponding stop (Mark nailed the last entry), I purchased a small position of front month puts. Then, since I knew they were dangerous I purchased a passel of March expirations and to make myself whipsaw proof I purchased some leaps. This strategy has worked well on this trade so far. I ditched the front month and more than half the Marches on the break of that channel yesterday, but I held onto the leaps and a small portion of Marches to make sure I stayed in the trade. That has worked so far, and now both Mark and I will look to get back into the battle in a more leveraged way when we see another clean entry opportunity.